The year is 2084, and mans' own creations, the robots, have turned against him. Your mission is to save the last human family on Earth from the hordes of rampaging cyborgs. Williams continued their reputation for hectic, frenetic action with this game, set in a single screen gameplay area. 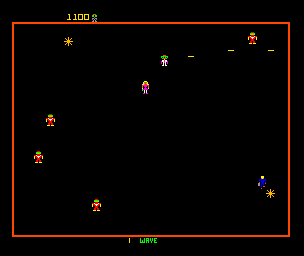 You are placed in an arena and must rescue the humans (by collecting them) and destroy the robots (by shooting them). You are able to move in 8 directions and also to fire in 8 directions. 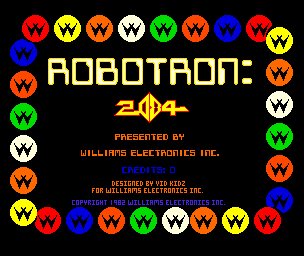 Robotron used 2 joysticks, one for movement and the other for firing, to allow you to move one way while shooting in a different direction. You encounter various types of enemy which must be avoided (hulks) or destroyed - Grunts, Spheroids, Enforcers, Quarks, Robotron Tanks, Brains, Cruise Missiles and Progs. Each of your adversaries has a different attack ability, which your must counter with their destruction. Collision with any object on screen except for a human is fatal and loses you a life. Grunts simply march on your position relentlessly, attempting to collide with you. They speed up as time passes on each level, until they cannot be avoided and must be shot. The hulks are indestructible and their main aim is to kill the humans and kill you by trapping you and running into you. Spheroids tend to stay near the edges of the screen and release Enforcers which move towards you and fire large bullets. 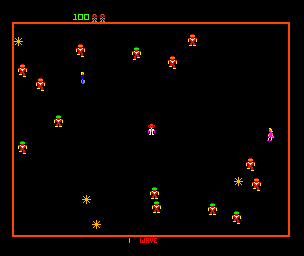 Quarks release deadly Robotron Tanks, which are very fast-moving and fire lots of diagonal shots which bounce back into the arena off the borders of the screen. The best armed enemies are the Brains. They fire Cruise missiles which home in on your position, zigzagging all the way, thus making them very difficult to destroy. They also have the ability to capture and reprogram the humans into Progs, which home in on you with deadly intent. Rescuing humans: 1,000, 2000, etc up to a maximum of 5,000 then 5,000 points for each one thereafter. Concentrate on rescuing the humans wherever possible, as they yield the biggest points reward. A good example is the first Brain wave (5) when you can easily collect 8 or more 5,000 point humans. As you start each wave, you get a split second as the robots appear to determine their positions. Collect any humans in the gap in the centre of the screen before breaking your way though. Brains should be killed as quickly as possible, before they can mutate humans. Their Cruise missiles can be shot, and are easier to hit if they are following you along one of the edges of the screen. Tanks are probably the hardest enemies to fight as they fire lots of bouncing bullets, so you should destroy as many Quarks as possible before they release Tanks.